The Journey to Interprofessional Collaborative Practice: Are We There Yet? Like many other medical and health-related professions, the speech-language pathology and audiology professions have been responding to the changes in the ways in which healthcare is delivered. These changes are occurring at the federal and state levels due to changes in legislative and regulatory policies. To this end and as a result of reports from the World Health Organization (2010, 2011, 2013) and the Institute of Medicine (2000, 2001, 2015), healthcare professionals are now addressing healthcare service delivery within an interprofessional, collaborative practice and patient outcomes context. 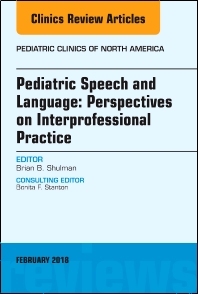 This volume of Pediatric Clinics will present articles that address clinical care to a variety of pediatric speech and language clinical populations. While it will be the intent of each piece to address interprofessional perspectives of care, the opening and closing pieces, respectively, will introduce and then synthesize, all of the articles into a cogent volume. Articles are devoted to the following topics: The Journey to Interprofessional Practice: Are We There Yet; Late Talkers: Why the ‘Wait and See’ Approach is Outdated; A Pediatrician’s Guide to Cleft Palate Speech and Non-Cleft Causes of Velopharyngeal Insufficiency (VPi); Supporting Children with Autism and Their Families: A Model for Interprofessional Practice; Feeding Problems in Infants and Children: Assessment and Etiology; A Multidisciplinary Team Approach to the Differential Diagnosis of Children with Communication Disorders; Open Up and Let Us In: An Interdisciplinary Approach to Oral Health; Otitis Media: Beyond the Examining Room; Clinical Perspectives on Pre-Literacy Development in Young Children; Using the ICF Framework to Achieve Interprofessional Functional Outcomes for Young Children: A Speech-Language Pathology Perspective; Developmental Care of the Pre-Term Infant: From NICU Through High-Risk Infant Follow Up; Interprofessional Collaborative Practice: What That Means for Early Intervention Service Delivery; The Role of the Speech-Language Pathologist in Creating a Model for Interprofessional Practice in an Ambulatory Care Clinic; and Identification of Speech and Language Delays in Young Children: An Important Collaborative Role for the Pediatrician.